• New rooms, new look—main/entry level rooms are high impact and high traffic areas. 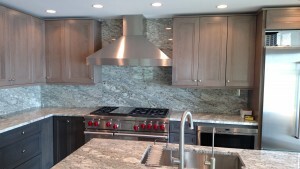 That is why we made some meaningful and strategic changes to this home’s kitchen, living area, and dining room. Now both the residents and their guests can enjoy a remarkable new look in a truly transformed home. • Brand new attic, furnace, AC, and ducting—this involved many steps including: vacuuming and removing insulation from the attic; removing an old AC unit and replacing it with a new one; and replacing the existing baseboard heat with a forced air system. 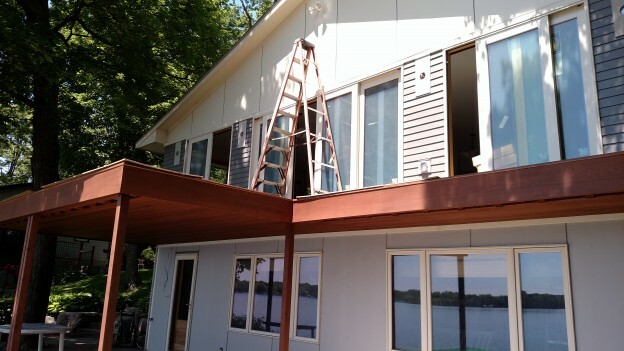 • The lake-view never looked better—we added three new patio doors (two six ft. wide and one twelve ft. wide) to this home to give a fabulous view of the lake. This made all of the difference in the world for a lakefront property. 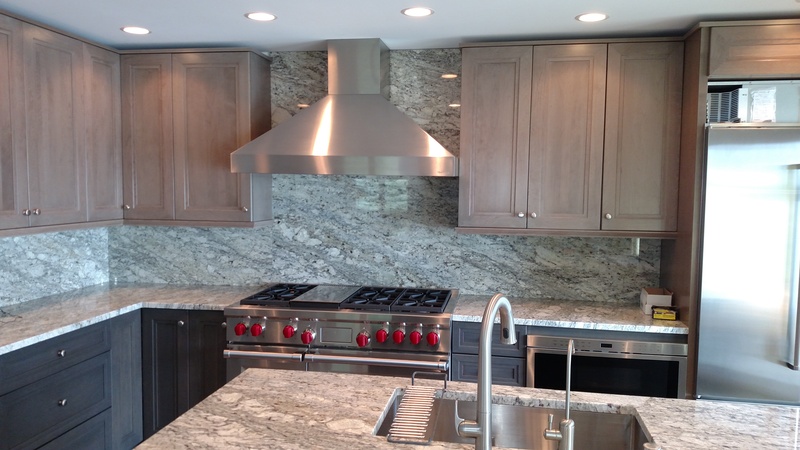 • Maple millwork and pre-finished cabinets adds the perfect touch—we put in new engineered, pre-finished rift and quartered white oak 5” wide planks for beautiful flooring and stunning matching cabinets. • Exceptional Zuri decking over a new deck— we made this important update to manage water and keep space under the deck dry. We also added stainless steel cable railings to compliment the structure. • Front yard fun—for curb appeal, we worked on a completely new stoop and garage driveway. 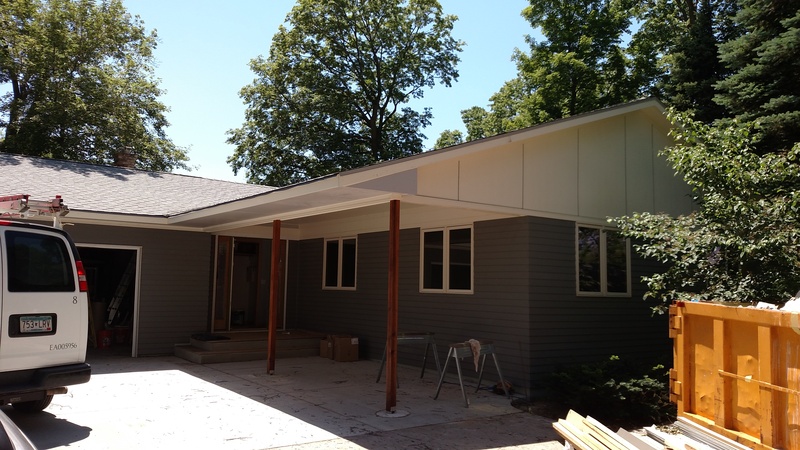 And that’s not all; we also utilized maintenance-free Hardi pre-finished siding, soffit, and fascia along with new shingles to enhance the home from both the curb and the lake. Now, the amazing inside matches a new and refreshing outside to create an all-around property metamorphosis. 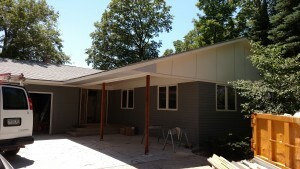 We had a great time working on this home and continue to love helping families achieve their renovation dreams. If you would like to learn more about this project or maybe start an entirely new one of your own, contact us and we’ll get started! This entry was posted in Uncategorized on June 27, 2016 by Krista Boyum.